We’ve all heard the phrase “as cool as the other side of the pillow,” and anyone who has tried to get to sleep on a hot night can attest to how important that is. Even when the weather isn’t too hot, we’ve all had the experience of tossing and turning—and flipping from one side of the pillow to the other—in an attempt to get to sleep. 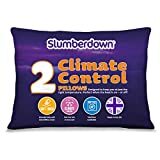 These days, pillow manufacturers have helped us all out by making pillows that are designed to stay cool and comfortable, with no flipping necessary. A cooling pillow is a great addition to a bedroom set, and here is how you can find the best one for your bed. You’ll see that there are “all-natural” cooling pillows, that can employ buckwheat husks or bamboo-derived rayon material. Then there are memory-foam pillows, which assume the shape of the person sleeping on them. And then there are combination pillows, which combine the memory-foam with a cooling gel, which is designed for better ventilation. We can group cooling pillows by the cooling method that they employ. The principles of the workings of cooling pillows are to cool by means of 1) conduction, 2) evaporation, or by using 3) phase change materials. Conduction: The most common cooling pillows on the market aren’t all that different from the ones that most people already own--they just have a cooling agent added. For example, water or gels can transfer heat away from the body into the water or gel. So some cooling pillows are in the form of a cooling insert, which consists of water or gel in a plastic bag. You place the bag of water on top of your existing pillow. One such pillow working on the water-bag type insert uses a bag that consists of layers of polyester foam. You fill the bag with water, and the pillow’s inner foam layers absorb and retain water. That keeps the water from moving around, as it would in a water bed. The water drops to the ambient temperature in the room, which (hopefully) is less than your body temperature. It will make you feel cool until you reach an equilibrium between the ambient temperature and your body temperature. Evaporation: There are also cooling pillows that use air flow and evaporation of moisture to cool off the user. For example, the cooling pillow filled with buckwheat hulls works on evaporation. Buckwheat hulls are used in many upholstered products, including pillows. The hulls do not conduct heat as much as synthetic products, because once the buckwheat groats are removed, the husks are incompressible, leaving a lot of empty space in the pillow to allow air to flow. Since there is air flow, it evaporates the moisture that collects on your skin while sweating. Evaporation is a cooling process, so it will successfully make you feel significantly cooler. Also, humid air near your skin will circulate through the buckwheat hulls, leaving you feeling cooler. Phase-changing materials (=PCMs): Pillows with phase-change materials absorb heat when changing solid to liquid, and release heat when changing from liquid to solid. Phase-change materials are an example of a spinoff from NASA's space program that found use in everyday products. NASA originally used phase-change materials in spacesuits, to absorb and release heat when necessary, to keep astronauts comfortable. At high temperatures, phase-change materials absorb heat, and thus cool you off. If the temperature drops, a PCM releases its stored heat to warm you. PCMs were later employed in blankets, underwear, blankets and pillows. For example, SleepBetter's Iso-Cool Memory Foam Pillow has a 100% cotton cover, and visco-elastic memory foam and PCM beads. The material adjusts to the body's temperature: if the body is too warm, it absorbs heat. If the body feels too cold, it insulates to regulate the body temperature. “All natural”: These pillows skip the gels and other synthetic cooling agents, and instead are filled with things like shells and husks, which allow air flow to cool things down. 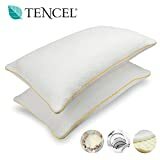 Even though gel-lined pillows are perfectly safe, all natural pillows are a great alternative for people who like to keep the synthetic materials in their lives to a minimum. There is a concern that people with asthma might find themselves to be allergic to unprocessed and uncleaned buckwheat hulls, however--so they may be compelled to use synthetic pillows instead. Memory foam: These pillows use the same materials that are used in memory foam mattresses-along with a cooling agent—to provide maximum comfort by subtly reshaping themselves to match their owner’s body and sleep style. Memory foam is considered somewhat dense, so it has a tendency to retain heat. Also, memory foam pillows can be a bit more expensive, but their level of personalized comfort is unbeatable. You can find memory foam pillows that are a solid block of foam, but there are also shredded foam pillows, which allow you the freedom of removing some of the filling according to what you find most comfortable. The shredded memory foam pillows also allow air to flow through the foam particles--which is an advantage over the solid foam pillow. Coolness: This is a pretty obvious one. When people pay extra money for a pillow that will keep them cool, they expect it to work. The best brands provide a cool surface that lasts well past the time its user has gone to sleep—in other words, they help people get to sleep faster and don’t leave them waking up to a sweaty pillow. 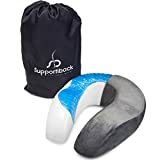 Support: Just like any other type of pillow, a bad one can leave its user with a sore neck or headache in the morning. Good models don’t do that—they provide the perfect amount of strength to comfortably support the sleeper’s head and neck. For example, Bed, Bath & Beyond offers the Serta IComfort Sleep System Contour Cool Action Dual Effects Memory Foam Pillow. It is specially made to support the head and neck while sleeping, by reducing the pressure on sensitive areas. It employs both memory foam and cooling gel, for cooling comfort by improving air circulation. The pillow is machine washable, made from 100% polyester. Serta also make the Freestyle pillow, that has an arch cutout and low profile. If you sleep on your side, it supports the shoulders. If you sleep on yFreestyle our back, it is made to support the neck. And if you sleep on your stomach, the low profile and gradual slope of the pillow will provide comfort. Adaptability: The best brands are designed to adjust to users’ heads and necks; they’re not “one size fits all” pillows that people need to adjust to. Durability and Fluffiness: Like any piece of bedding, pillows will eventually lose their springiness and will need to be replaced. For the best ones, though, that won’t happen for a long time. Some people prefer the The Too Cool Pillow! Essence of Bamboo Pillow by Fote Home Goods. Their pillows are even machine-washable, and are filled with poly fiber. It retains its fluffiness longer than a down pillow: even though it packs compactly to less than 1 inch, it expands upon use to 6" thick. Price: The pillows from synthetic materials can be significantly cheaper than pillows made from down. Some have shredded the synthetic material, so as to give it the same consistency as down. That will give you the comfort of down, at the price of a synthetic pillow. Size of the pillow: Just like there are different size beds, you can find pillows in a variety of sizes. Make sure that the pillow matches your bed size. 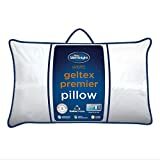 For example, the Equinox Cooling Gel Memory Foam Pillow measures 24" L x 16" W x 5" D. But there are also standard (20" x 26") and king (20" x 36") sizes. 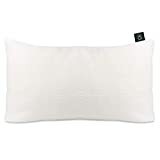 The Coop Home Goods Premium Adjustable Loft-shredded Hypoallergenic Certi-PUR Memory Foam Pillow allows you to remove some the filling from the pillow, so that you can get it to be the size that you want. Good for some medical conditions: People who suffer from multiple sclerosis say that they suffer intolerably during hot weather--but a cooling pillow is an effective relief. Women who suffer from hot flashes also notice considerable relief with a cooling pillow. 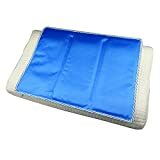 Refrigerated pillows: The Human Creations Gel'O Cool Pillow Mat is intended to be placed on top of the pillow, beneath your head. It can be refrigerated or microwaved to either be used for cooling or heating. The pillow mat dissipates the heat from your head, but can be refrigerated to cool even more. It is recommended to place a towel between your head and the mat, for extra heat dissipation. Odor of Memory Foam: People have complaints about the smell of memory foam--although the manufacturers assure everyone that the smell is harmless, some people find it offensive, and also find that the smell won’t go away even after airing it out. But the memory foam comfort and form-fitting tendency balances that out. What is the pillowcase made from? : Not only is the material of the pillow important. The material of the pillowcase is just as significant, to allow proper heat transfer. The Equinox Cooling Gel Memory Foam Pillow has a pillowcase made of Spandex mesh, which is machine-washable. The Too Cool Pillow! Essence of Bamboo Pillow by Fote Home Goods has a cover that is from bamboo-derived rayon and polyester. Bed, Bath and Beyond offers the Healthy Nights Circular Knit Cool Finish Pillow Protector that you slip on over a memory foam pillow. 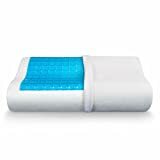 This product can significantly extend the life of your memory foam pillow. It is made from 100% polyester, and is machine washable. 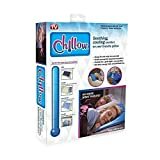 It zips securely onto your pillow, and wicks away moisture at a rate that varies according to your body temperature: when you're hot, it can keep you cool, and when it's cool in the room, it provides insulation. Memory foam: If there is a stain or spill on a memory-foam pillow, you can spot clean it with a damp sponge. Take care not to get the foam sopping wet. Put the pillow in an upright position until it dries. To remove odors, try sprinkling the foam with baking soda, and then shake or vacuum it off.You should also air them out from time to time. Machine washing is also possible, if you wash in a cold cycle and machine dry on a cool setting. Buckwheat hulls: You might have thought that you can’t launder buckwheat hull-pillows--but they can be washed. You’ll have to empty out all the buckwheat hulls from the pillow into a container. It's best to invert the pillow shell, so as to remove any remaining buckwheat hulls (you don't want them to scatter into the washing machine). Put the buckwheat hulls in the sun for a few hours, so that they dry out. It will also remove any odors. If the buckwheat hulls get wet, or if you spill water on the pillow, you will have to empty and dry out the hulls before using the pillow again. Cooling Material: The “active ingredients” will vary from pillow to pillow, with some using natural materials while others go with synthetics. They’re all safe to use, but if you prefer one type of material to the other, be sure to look it up before purchasing a pillow. Pillow Material: This one has to do with the material around and under the cooling agent. Like any other kind of bedding, cooling pillows come in a variety of natural and synthetic materials, so choose a pillow that matches your materials preferences. Allergens: Just about every pillow you find in a reputable shop or on a reputable site will be safe, but that doesn’t mean that they’re safe for all users. Make sure to check out all of the materials that a potential pillow is made of before purchasing. You might also try to find a hypoallergenic model (there are plenty out there). One of the most invasive allergens are dust mites. Unfortunately, they can infest any type of pillow--even if the pillow is made from synthetic material like memory foam, dust mites still feed off flakes of human skin and scalp. There are dust mite pillow cases, that are made from vinyl or plastic. That keeps the organic material from your body from penetrating into the pillow and feeding the dust mites. 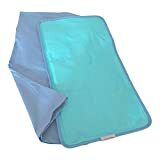 The problem is that a vinyl or plastic case will not let air flow through your pillow either, and will feel rather hot and sweaty (the opposite of why you wanted a cooling pillow in the first place). Sleep Better: is dedicated to helping people get plenty of rest, so they don’t just sell high-quality bedding (although they do that too, obviously); they also give advice about how to find the best night’s sleep.They were created by Carpenter Co., manufacturers of comfort cushioning products since 1948. Their headquarters is located in Richmond, Virginia. 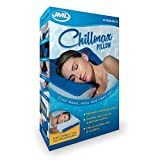 Their Iso Cool Memory foam pillow (found to be one of the best-rated cooling pillows for 2016) has PCM beads inside to absorb heat and keep you cool. Sleep Innovations: Sleep Innovations makes just about everything you might need to furnish your bedroom, from pillows of all sorts to mattresses and box springs. Their Reversible Gel Pillow was voted to be one of the best cooling pillows for 2016. It has memory foam on one side and gel-infused foam on the other side. This design allows you to flip sides when the part that you've been sleeping on doesn't cool you sufficiently. Coop Home Goods: is a family-owned business run by Kevin and Jin, whose family has a long background in clothing manufacturing for the home and producing textiles. Their first product was the shredded memory foam pillow, which they launched in 2013. They also make bedding products and home appliances, such as spin mops, deodorizers, dish drying mats, and more. Human Creations--are retailers of consumer electronics, household items, sports and fitness equipment, and school and office supplies. They are a brand of KindMinds Innovations Inc., located in Taipei, Taiwan. 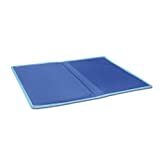 They make the Gel'O Cool Mat and Pillow Mat, which you put on top of your bedsheet or pillowcase. Restwell--is a Canadian manufacturer of quality mattresses and bed foundations. They were founded in 1990, making spring core mattresses, back supporters, pillow tops, eco-based and specialty foams, and heavy duty bed foundations.